This user-friendly bottle of DaVinci Gourmet sugar free gingerbread flavoring syrup allows your busy baristas to quickly and easily serve up delicious hot, cold, or blended drinks with irresistible flavor without the sugar content! DaVinci Gourmet flavoring syrups complement your beverages without overpowering them or being too sweet. They are specially formulated to resist curdling in milk and hold up well under heat, making them the perfect choice for espresso-based drinks, brewed coffee or tea, and more. I keep this syrup out on my area at the coffee shop around the holidays and it is a big hit. I now use this stuff year round because of how good it is. This DaVinci Gourmet Gingerbread Sugar Free Coffee Flavoring Syrup is a great addition to our gingerbread protein shake. Highly recommend and I will be buying again. Adding this flavor to our holiday during menu will bring many other options for creating holiday springs and desserts. The flavor is not overpowering, and pleasant. Gingerbread, sugar free, do your customers a favor and get this syrup. They will be delighted by the smooth flavor and amazing taste with zero sugar. 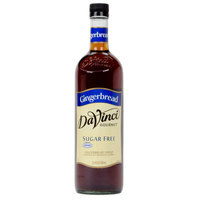 DaVinci Sugar Free Gingerbread syrup was a delicious addition to my morning coffee. It has a mild flavor adding the perfect sweetness to my coffee. Will definetly be enjoying this all season long. Ordering was easy. Prices were good! Received items quickly! Packaged very well. Makes great flavored coffee. Delish! You will not go wrong ordering from this company. This one is a popular one for the holiday season. It does have the gingerbread flavor. Most liked this one in coffee and as a drizzle on treats. I dislike the splenda brand. December holiday time is my favorite coffee time of year, since this syrup tastes so much like gingerbread I enjoy it all the time. Also I tried the sugared one and could not taste a difference between the two.